William Jefferson Clinton (born August 19, 1946) is an American politician who served as the 42nd President of the United States from 1993 to 2001. Prior to the presidency, he was the Governor of Arkansas during two separate terms, from 1979 to 1981, and again from 1983 to 1992. Before that, he served as Arkansas attorney general, from 1977 to 1979. 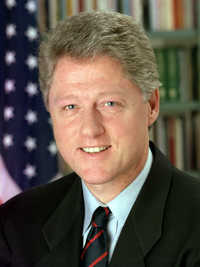 A member of the Democratic Party, Clinton was ideologically a New Democrat and many of his policies reflected a centrist "Third Way" political philosophy. Clinton was born and raised in Arkansas and is an alumnus of Georgetown University, where he was a member of Kappa Kappa Psi and the Phi Beta Kappa Society; he earned a Rhodes Scholarship to attend the University of Oxford. Clinton is married to Hillary Clinton, who served as U.S. Senator from New York from 2001 to 2009, United States Secretary of State from 2009 to 2013, and was the Democratic nominee for U.S. President in 2016. Bill and Hillary each earned degrees from Yale Law School, where they met and began dating. As Governor of Arkansas, Clinton overhauled the state's education system and served as chairman of the National Governors Association. This webpage uses material from the Wikipedia article "Bill_Clinton" and is licensed under the GNU Free Documentation License. Reality TV World is not responsible for any errors or omissions the Wikipedia article may contain.